Making transparent soap from scratch is not very difficult, but patience is definitely needed, as it definitely takes several hours. 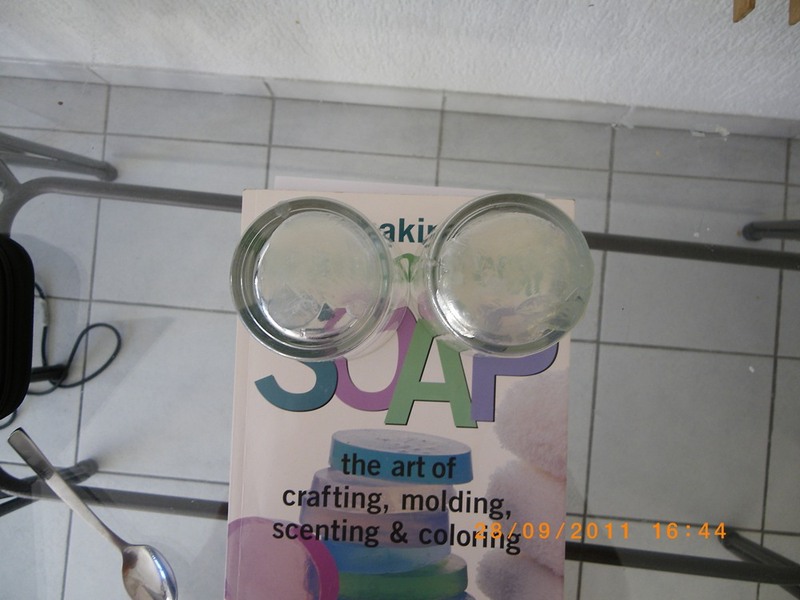 You can read in almost all of the “how to make transparent soap” manuals, that to master the technique, it is a big advantage to be familiar with the hot process soapmaking. Indeed, but I tell you what – I did try to make transparent soap without any hot process experience. Actually, I only made a few batches of a cold processed soap at that time. So yes, it is possible even without much experience, but you must be patient. I do not recommend making transparent soap, if you never did soap from scratch, as the technique is quite complex and requires at least an experience from the cold process technique. The recipe I use here is a rescaled version of the Basic Recipe 2 (page 66) of the book Making Transparent Soap: The Art Of Crafting, Molding, Scenting & Coloring by Catherine Failor. 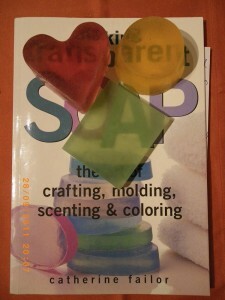 If you wish to make transparent soap on a regular basis, I highly recommend you to buy this book. It has a perfect troubleshooting section and much much more information I could possibly give you here. What gives the transparent soap its transparency are solvents. then the solvents are added to make the soap transparent. only after that soap can be poured into molds. The water should be distilled. Hard water can contain minerals and salts that can cause cloudiness. Alcohol – According to C. Failor, it is impossible to make a transparent soap without alcohol. Or, it is possible, but such a soap looses its transparency with time. The best alcohol is denatured ethylalcohol of 90%. I add that you can use instead a propylene-glycol, which will make your soap meltable => you will obtain a meltable M&P soap base! Glycerin – Glycerin is another good solvent, which has in addition also a moisturizing effect, however, it is highly hygroscopic – attracts water. If there is too much glycerin, the soap will be soft and sticky as it will be attracting water from the humid air in the bathroom. The soap will look like if it was sweating. Too much glycerin also causes cloudiness . Sugar solution – Sugar is also an excellent solvent, apparently gives the final touch – without sugar the soap is not fully transparent. Disadvantages are the same as for glycerin – too much causes soap sweating and cloudiness. Given the large amount of solvents added to the soap in order to achieve its transparency, recipes giving hard soap bars are preferred. The oils giving hard soap bars are those containing high fraction of saturated fatty acids, like tallow, palm, palm kernel or coconut oil. Palm oil or tallow do not dissolve readily in the water, therefore the soaps are not very bubbly. 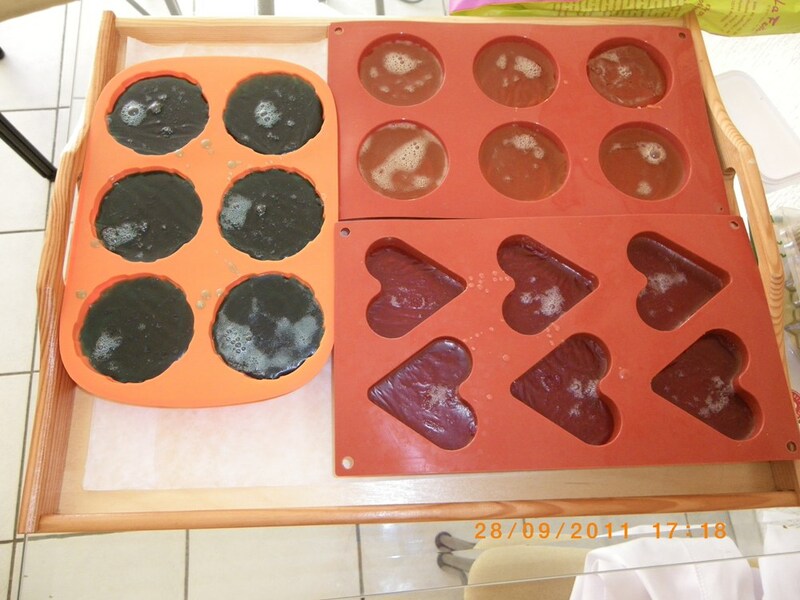 Palm kernel oil or coconut oil – create very bubbly and hard soap, but it can be drying. It is of interest then to add soft oils. As a soft oil of choice is usually selected castor oil– it mainly consists of ricinoleic acid, which gives soap with particular qualities, ideal for homemade transparent soap. Alcohol: 30 – 35% of actual soap mass (defined as oils + solid NaOH in the recipe, without water!). In overall, it is more precise to work with grams (I did work with grams) than with ounces, because in the transparent soap, each small difference matters. Mixing the lye solution and oils at 50°C (122°F) to trace. Mix everything thoroughly until the soap dissolves in solvents. This is how it looks like just after dissolving of soap. You can see the foam creating on the top. 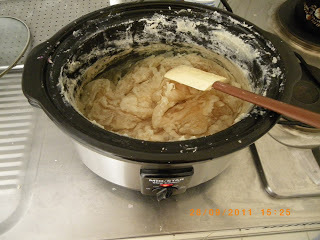 Let the mix on low heat for about 30 minutes (HIGH in crockpot). Cover the pot with a lid – it should be air-tight, otherwise the alcohol will evaporate. C. Failor recommends using a plastic sheet fixed with ropes instead of a lid, however, I find it a bit complicated and finally I didn’t need it – my crockpot lid worked well. Bring to boil and immediately turn off – the water should not evaporate and the rest of the sugar will dissolve in the hot water. After 30 minutes add the sugar solution to the soap solution and mix well. Remove the sticky foam from the top and put it in some mold – it can be used as a soap after cooling. Take a frozen glass from the freezer and turn it upside-down. Pour about one tablespoon of soap on the bottom. The hot soap solution is always transparent, so you can judge on final transparency only after cooling – because the glass is frozen, the cooling will be fast. If you see pronounced milkiness you have to add more solvents. If the transparency test was unsuccessful, add small amount of the sugar solution(see, this is why it is good to prepare more!). 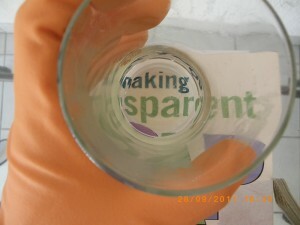 Repeat maximum twice, each time testing for transparency, if still pronounced milkiness, switch to alcohol or glycerin. Do not add too much solvents, because this causes sweating and on the contrary – milkiness. 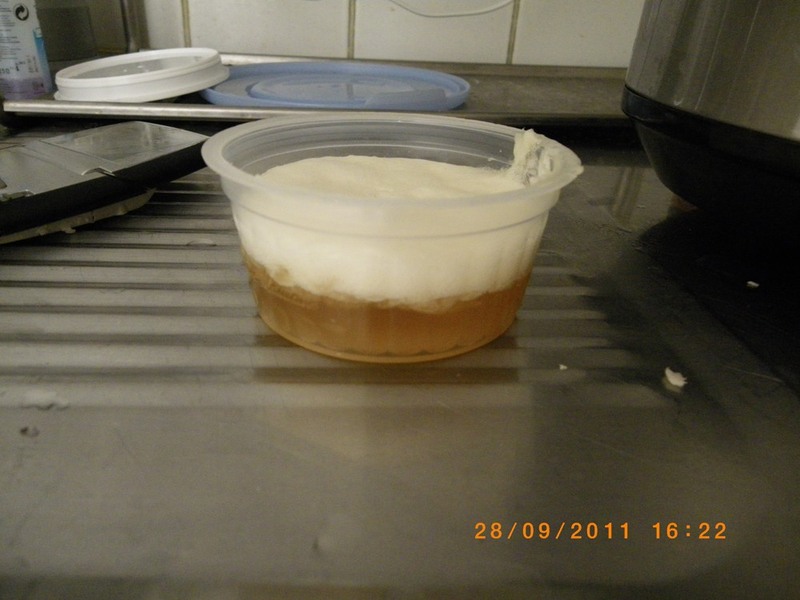 Left sample – after adding 40g of sugar solution, right sample – after additional 40g of sugar solution. Small amount of sugar solution means 40g (1.4 oz) for this concrete recipe. Just calculate the percentage and amount for your own recipe to get the weight you need. I added the sugar solution twice, I didn’t want to risk more. Repeat 8 and 9 until transparency. This step is very critical and you need all your patience (I do not have it). It can take an hour or just few minutes if you are lucky. Do not hurry, the soap solution is ok on the low heat for a long time. When you are happy with the transparency, color and scent your soap solution. Attention, the color can affect the transparency. 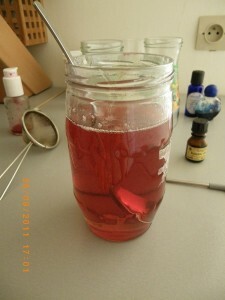 Good news is that you can use any food coloring without them changing color, as the saponification is already finished! Finally, pour the soap into molds – the best are one bar molds – we want the soap to cool as quick as possible – this also ensures transparency. Put the forms in the fridge. When pouring, small bubbles will create on the top (and as I found, not only on the top :-/ ) – disperse a bit of alcohol, that should dissolve the foam. Enjoy and let long live your bar of soap! 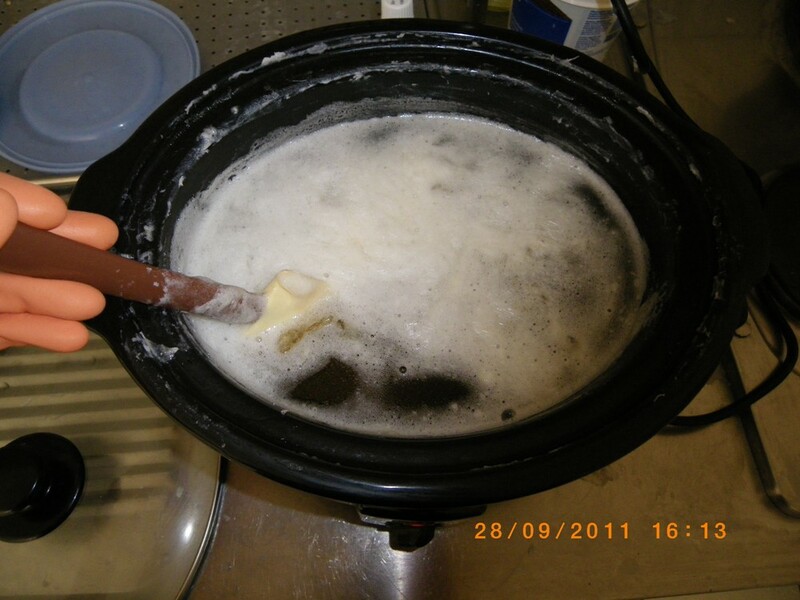 This entry was posted by evik on September 15, 2011 at 12:57, and is filed under soap recipes, soapmaking, soapmaking techniques, soapmaking tutorials. Follow any responses to this post through RSS 2.0.You can leave a response or trackback from your own site. Hi Reham, I admit that I am not sure what you mean. Do you mean make it a liquid soap? Hi Nancy, frankly, I never tried with olive oil only, if this is what you meant. 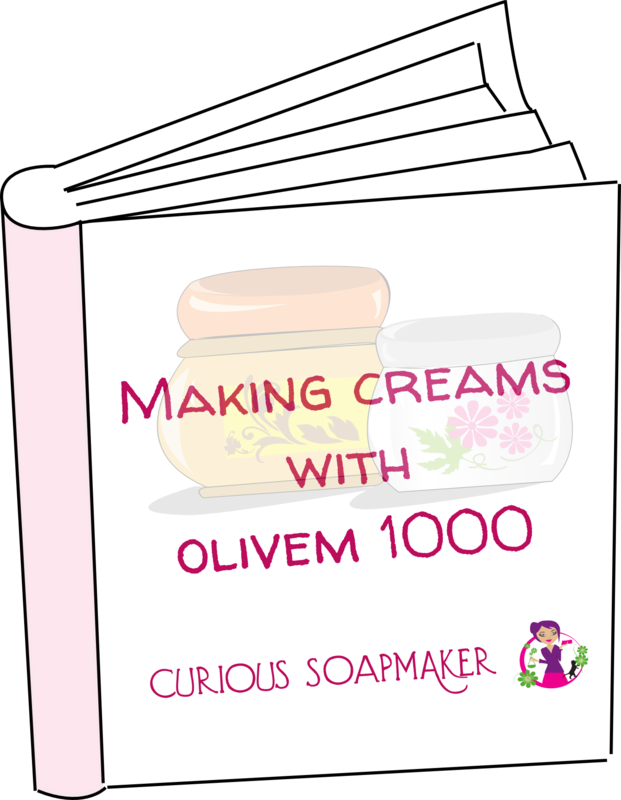 Theoretically, olive oil is not good for transparent soapmaking, because olive oil soap is more difficult to dissolve. The risk is you will get a translucent, not transparent soap. However, I did not try it, if you do, please, keep me informed! Yes, around 4 oz bars. If shea butter works I simply do not know. Probably not very transparent, I never tried, but would love to know, could you keep me updated once you try? On you soap calculator what does INS and SAP mean I have read the information and do not see what those mean. Linda, which soap calculator you mean? In any case, SAP means saponification value (amoung of KOH in grams you need to saponify 1g of oil) and INS stands for iodine value (is the mass of iodine in grams that is consumed by 100 grams of oil) . I like it. It is good and worthy. Did you ever tried to use other solvents successfully and how were the results if you could share. Because I also wonder why other recipes always use all the solvents together, you among the few only use Ethanol+Glycerin+Sugar. Now I want to see if ie: Propelyn Glycol+Glycerin+Sugar will work the same. Maybe even other combination but simpler. Also just wondering if you know why/how people use sorbitol, TEA, cocamidopropyl betaine, stearic acid, myristic acid etc for the transparent soap? I tried propylene glycol instead of alcohol and it makes the transparent soap meltable. I did not succeed in making it transparent, only translucent. All the other variations are used to get meltable soap base (either transparent or not). If you want it to be meltable, you need to increase the evaporation point, so that it melts before it evaporates. This is impossible with alcohol, which evaporates at low temperaturs. Propylene glycol has much higher evaporation point and yet makes the solution. Those containing cocamidopropyl betaine, sorbitol, TEA, stearic, myristic etc acid are meltabe soap bases. 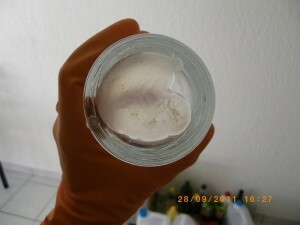 Cocamidopropyl betaine is a surfactant that foams and emulsifies and helps it to melt easily together with sorbitol etc. I believe, there must be a special ratio between glycerin-alcohol and sugar solution kept, and that is probably why it is calculated in that complicated manner, although can be easier, once that ratio is found. I have to think about it! solidify,it almost two days now please what can be the cause and how do i go about it? i made this soap using the same recipe but in exactly half the quantities. and i used grams, everything seemd okay and i was able to get the transparency required in the first go. but, my problem is that not only this but every other transparent recipe i try comes out to be very very soft n the surface is very slimy. can you please suggest any remedy. can u recommend quantities for using olive oil and cocconut oil? evik i tried calc.soap but i not understand about water 190 proof and water 151 proof. what is meaning about that? I want to ask you can i make transparent soap with only coconut oil? Or transparent soap is just made with oil combination? And which fomula you used to calculate the lye from the oil to make sure the oil is completely saponification? And the residual oil or the lye cause the claudiness or not. Hope to have your answer. Thank you. Hi Crysts, this is a good question. I tend to say no, but on the other hand, I never tried it and also I made transparent liquid soap only using coconut oil (but this is not exactly the same). I use Soapcalc – http://www.soapcalc.net to calculate amount of NaOH to be used for saponification of my oil. It is mainly residual oil that can cause cloudiness. Hello .thanks for your super comment for transprant soap. please teach me you don’t use stearic Acid? ! is youe soap hard after finish prosses? whit best regard . Hi Nicole, sorry, there was a plugin deactivated on my page, it should work now! This is a great article – thanks so much! 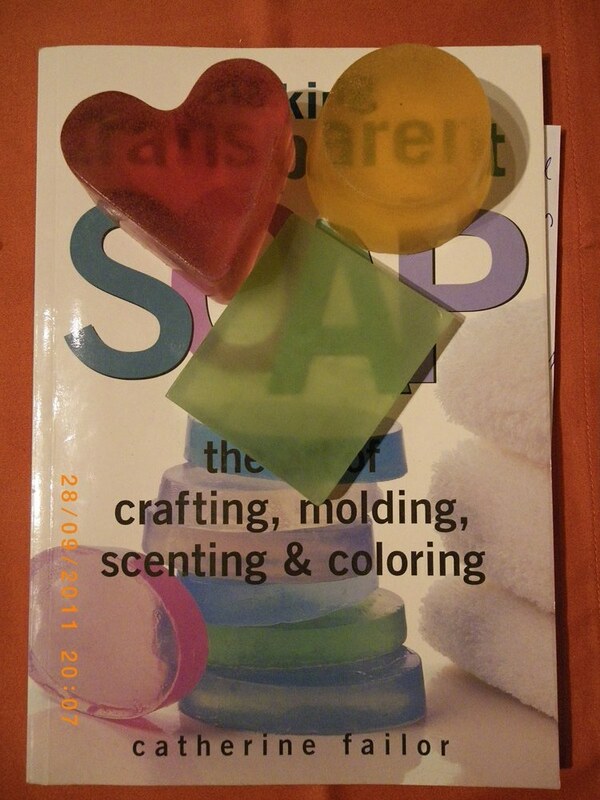 I’m very excited to be making my first batch of transparent soap and thanks to you (and to Catherine Failor’s book as well) I’m feeling much more confident! 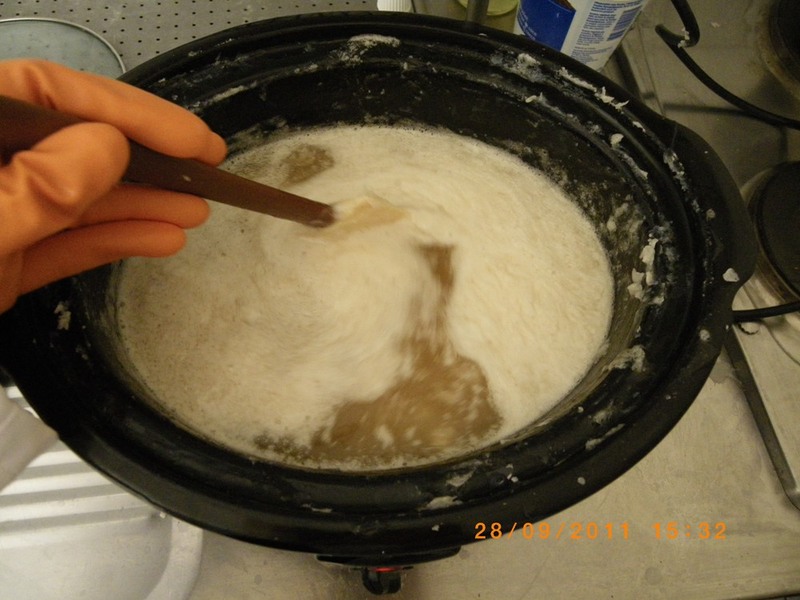 Thanks, i have done it according to your formula, but since one week i did the sample, it has been soft. Do you know the reaction if i increase the quantity of NaOH a bit. Hi Duru, well, I don’t advice to increase the quantity of NaOH, it is not going to help with the hardness and might make your soap too caustic. I would rather let the soap evaporate more water. The alcohol you used was 70%? First let me add: This is really a great help and gives me much more confidence! Thanks a bunch! Now my problem which I really hope you can add some light on. My problem is the prices, and for me in Denmark, this soap will be very expencive to produce. Some danish recipies for CP soap is with Copha which doesn’t cost much. Any chance that I can change the palm oil and coconut oil for copha? And what about changing the castor oil for something less extravagent? I need my soap to be meltable so Propylene glycol is my choice in alcohol. And I know it will be translucent, but I need as close to transparent as I can get for the lowest price. Any help is really appreciated. Thanks again! 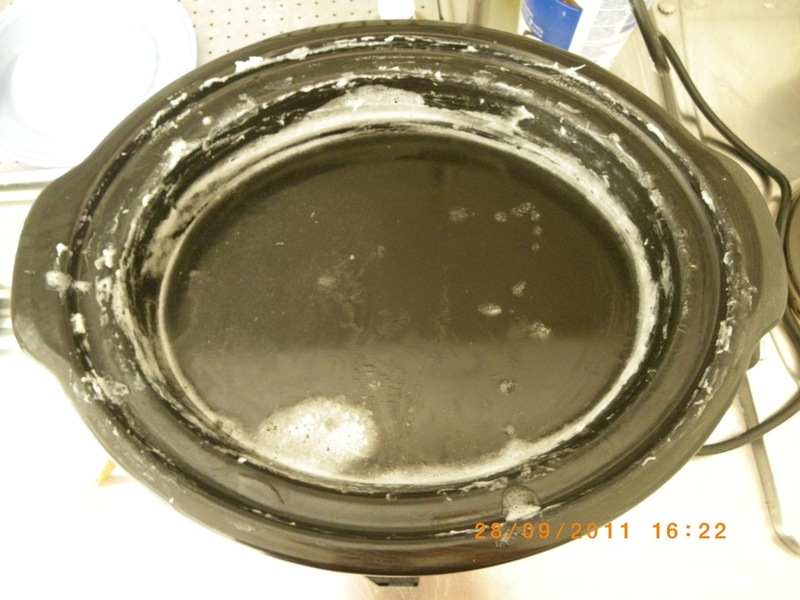 Hi Klaus, I think you might want to read this: http://blogs.hsc.edu/sciencejournal/files/2013/03/Saxton_Soap.pdf – here they try multiple M&P recipes, including one only containing coconut oil, glycerine and sorbitol solution. Thank you very much for the links. I will have to study them closer. Now I have ordered all components to your transparent soap here. As I told you I want it to be meltable so I have bought Propylene glycol. But after reading about the alcohol concentration in Ethylalcohol, and how to calculate the amount of water compared to concentration of alcohol, I suddently get comfused. Is Propylene glycol 100% alcohol? And should I calculate the amount of water compared to 90% Ethylalcohol in your recipe, or should I just exchange one alcohol for the other without thinking about water concentration? Anyway I will try it out today without calcuating and see how it turns out. Thanks again for all the great stuff you do for everyone interested in making soap. Now it is done, and the result is great, though more translucent than transparrent, and a little bit sticky. I am in doubt about gel phase and think I was way past it when adding glycerin and alcohol. And I chose to stop after adding sugar solution (my pregnant wife was hungry). It should be meltable anyhow, so I will try to melt 1/4 of it today and add more sugar solution. right now it looks a lot like your melt and pour soap thread. Both my wife and I like this soup alot. Thank you very much for this Evik, you help more than you think and I fore one is gratefull for that. Do you know if Klaus was able to determine the amount of propylene glycol to use in your recipe? I’d like to try it with propylene glycol. I used your recipe with Ethylalcohol & only made one mistake. Of course it was at the end. I prepared double the water/sugar solution as mentioned in #5 of your instructions, but instead of just adding 1.4 oz of it, I added the whole thing!!! It came out awesome, but too soft. I mixed everything at 18:00 and let it HP. 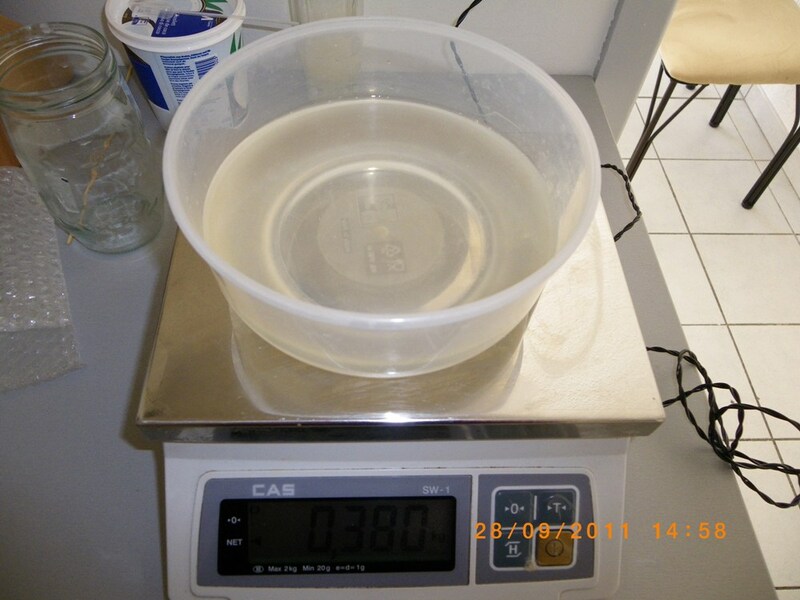 19:36 – I tested for pH, took it off the stove and added 70g of glycerine…. Together I added 150g of glycerin, 150g of sugar solution and 346g of PG. So receipe above didnt come out transparent? I was actually thinking of taking your original receipe & instead of using the 190 proof alcohol, use the GP. However, from reading other soap recipes it appears it’s not that simple. Thanks so much!! I’ll give it a try. I finally have a good answer about the propylene glycol. When using the same amount 100% of the recipy alcohol, you get a good result. But the will not be very transparent. You can read size 14 characters through 6mm of this soap, but it’s not much better than that. Further more, the soap is a little sticky and soft and doesn’t have a long lifespand when using. I find it to be a good soap and like the fact that the alcohol is non-flamable. Wikpedia website didn’t specifically say alcohol content of 99.5% or greater, just purification. So I figured 95% and 99.5% are not that far apart (I know crazy, but I have ADHD!!) so I tried it using your recipe above, not the other one. But, guess what? It worked. The only thing I did different was I used Lard instead of Palm Oil and I made a double batch of your 1.4 oz sugar water and I didn’t use all of it. 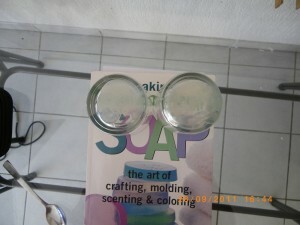 My transparency test showed soap was cloudy, so I just threw the soap piece on counter & added more of the sugar/water. After I did my 3rd or 4th transparency tests, which was still cloudy, I was getting pissed (that means aggravated in Louisiana!!! ), then I noticed the other pieces I threw on counter were transparent. 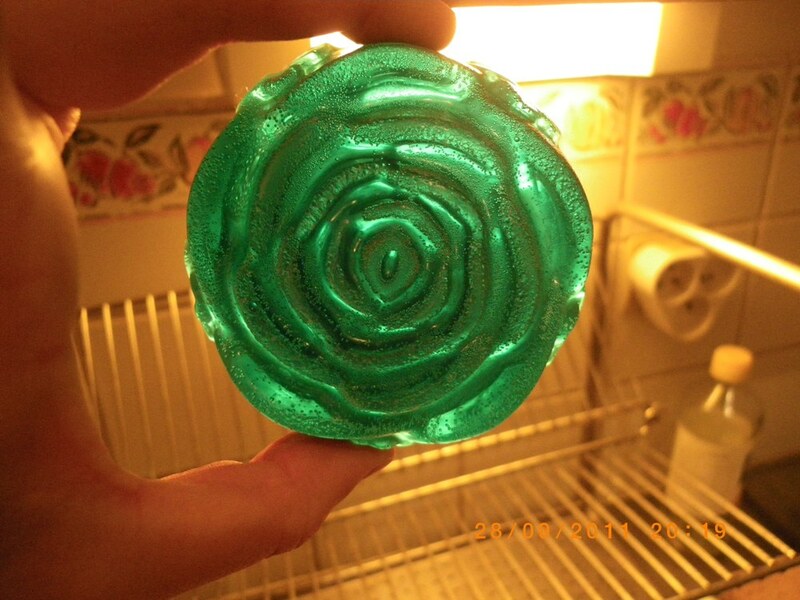 So, I just poured some into molds with food coloring & they came out transparent, not cloudy. The remaining soap that I did not add food coloring to came out yellowish/golden colored, but transparent. Sorry so long, but I figured I’d share because you were so gracious to share your information with me and everyone else. May God bless you abundantly!!!!! Sorry forgot it takes awhile for post to show up so that’s why I posted twice. Feel free to delete one of them. Also, another error, GP is supposed to be PG – propylene-glycol. Wonderful post here, I am going to try this myself. I’m just wondering can i use Bio ethanol as opposed to Ethanol? Finding it hard to buy cheap ethanol in the UK but Bio ethanol is all over. I have problem with transparency…when it gets cool the transparency become blur! i have tried more sugar, or more alcohol but not difference! Hi Atoosa, what is the exact recipe you are starting with? evik, what sort of alcohol do you use? High proof ethanol is rather difficult to obtain here without a special permit – some denatured forms (such as denatured perfumers alcohol, which is 95% v/v, denatured with tert butanol) are available from a handful of suppliers…would that suffice? 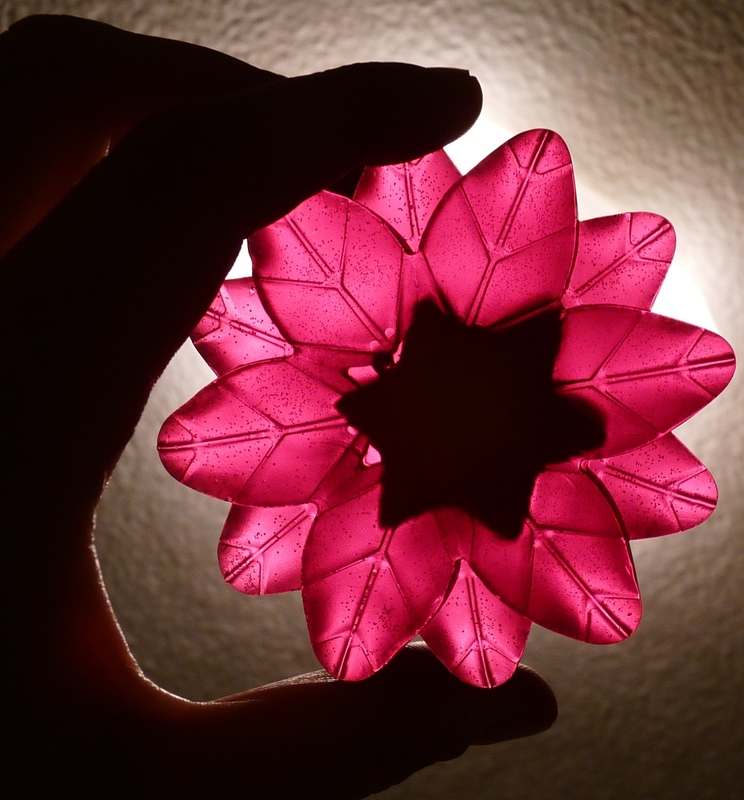 I am really, really struggling to make transparent soap! I live in the UK and obtained the licence for ethanol but it is still not transparent and then yaay! I found your recipe! But please, before I spend more money attempting it, will I need to use less water because I am using 99.9% ethanol? If so, how much would you advise? Please help before I turn to ethanol! Hi Amy, you have to make your ethanol 90% – this means you would use more water and less ethanol. In order to not get confused, just take 9 parts of ethanol and 1 part of distilled water and make it a 90% ethanol. Use this in the amounts written in the recipe. Good luck! Hi Evik! Thanks for posting your instructions on making transparent soap. C Failor’s book is a bit old fashioned & using your cooking method is ALOT easier. I made this soap last weekend using PG & have remelted it today & got great results! I added extra sugar solution on the remelt – transparency is great. But I used Failor’s recipe #1, instead of #2 like you did. I used tallow & the percentage is 52 (total oils) versus 33% in your recipe. My soap is transparent but rather yellow. Could the high percentage of tallow be the cause?? Thanks for this post, your answers to everyone & the time you’ve given us! Thanks for your answer. I was ready to try anything! I’ll be looking for your next post! There is a recipe & video from Good Earth Spa but it uses LOTS of additives & even she says it has a yellow tint. Too bad! I really wanted to use those lovely blue & red stained glass colors. Have a great week! help me to formulate for me how to make liquid soap 1litre if i have the following ingredients. 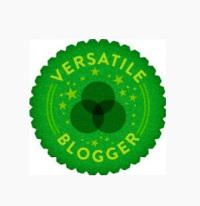 hi, your blog is awesome. i have a question. i want to make ultra clear soap, i haven’t bought catherine failor book yet, i don’t think that book will teach me how to make ultra clear soap. i saw your comment about its heard to make crystal clear soap. but there are a lot of people making and selling it, i really want to know how to make, any suggestion? Hi. I was trying to find out how to make transparent cold process soap. I have heard talk about it and read about it on a Canadian blog. I was looking for a basic recipe but ended up here Have you heard of it and wouldn’t it be a great idea for a new project? If you can shine any light on the process I would be very grateful. Keep up the good work. I have been following you a few years ! Thank you for your kind information.I am in the 8 grade from India.I am doing this for my science exhibition. Do you know how to make the transparent amino acid soap? Hi NQH, what do you mean exactly by amino acid soap? What does soap mass mean step 2? Is it the hard oils or?? Sorry I am not more experienced but have made cold process once, good luck with that. But I would like to do a have cold process then add the trasnsparent soap on top. Any thoughts on this? I have been dreaming of this version and want to make it! Hi Khristian – soap mass is the soap before you add solvents (sugar, glycerine and alcohol). You can definitely pour transparent soap on top of the CP soap, but the best is to do it while CP soap is still curing (and even better if it is still in the gel phase). This way the layer will not separate later on. CAN I USE SORPITAL SUGAR ALCOHAL IN THE PLACE OF ETHYLALCOHAL? Firstly, I love your articles! Very informative and concise. I am wondering if you have any experience in using sugar, glycerin, PG AND alcohol? Basically, I would like transparent soap, but getting 151 or 190 proof alcohol is very expensive while PG is very cheap. I am not concerned with it being meltable. I would just like to make transparent soap and most cost effective as possible. Also, do you know how adding sodium lactate or stearic acid affects soap made this way? In my CP recipes, I use SL to harden my soap because my favorite recipe has more soft oils than hard. 1. By mistake, I added 10 times d.water than the recommended quantity. The whole lot turned into liquid soap. It is amazing to use. I even took bath once with it. No irritation. Felt real soft. But it shows a dark pink color in phenolphthalein test. 2. Ethyl alcohol recipe gave a clearer soap but less firmer one. Despite cooking it for longer (1.5 hrs), it remained dark pink in phenolphthalein test. I made it into soaps thinking of leaving it for a week or two for curing. Will that really work? will my soaps turn colorless in phenolph. test after a week or two?? If not how do i reduce the pH? P.S. I tried washing hands with the soap once in a while. It feels really awesome. But I am worried about the color. 3. EtOH soaps are very soft. Can i use salt (1 ounze/kg) in this recipe? 4. PG Proplyene Glycol recipe – i used 150g glycerine as you recommended, but used only 150g of PG (half of what you used) and 75g of Sugar. The oils cooked really fast and in one hour the oil saponified showing colorless reaction with phenolpth.. I added the above mentioned solvents and the soaps were very good. But very soft.. softer than EtOH recipe. Very hard to handle. It just starts to melt away in water. 5. Second time PG recipe – Added oils & lye, cooked for like 2.5hrs. Still remained un-saponified (as per phenolphthalein test). I used 85g glycerol, 150g PG and 80g sugar. Recipe came out translucent. Please please help me with the pH thing of the entire lot. Why it turns dark pink even after cooking for longer time. ? I used a water jacket to cook the recipe. Please help me on how to reduce the pH of the entire lot of soaps/liquids i have prepared. With ANY recipe for soap, you need to use a soap calculator to determine the correct amount of lye. You also need to know the strength of the lye- – – is it 90% pure?… 100% pure? go to http://www.soapcalc.net . . . it is made so you can put in everything from your recipe & adjust your recipe. 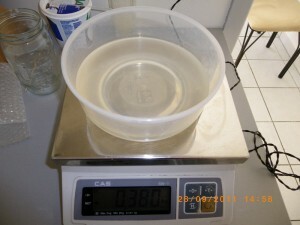 . . then it calculates it with the exact amount of water, lye, water, oils etc. & superfat %. You can also do what is called a superfat % . . . to make normal soap bars, one would use about a 5% superfat. . . . but people often use 0% or 1% superfat to have clearer, more transparent soap. I hope this little bit of info helps. please I have used this but my soap is not hardened, now what can I do? Did you follow the recipe exactly? If not, anything can be a problem, please, write me the exact recipe you used, with all the changes you have made, otherwise it is difficult for me to identify the problem. Also, it might be that you have to wait longer, it can take up to a week to harden. what about that you call “the sticky foam”? May be it is made by something that is put in excess, so the soap refuses it? Is it possible to avoid it, by changing something in the recipe, or in the instructions? I live in the UK and sadly have bought all the other ingredients to make clear soap only to find that I can’t get hold of denatured alcohol here Can I use methylated spirits? Would I need to do anything to it prior to using? And will my soap be purple/lilac if I use it? How can I adjust the PH if its levels aren’t good? Hi Daniela, try adding citric acid – I believe your problem is pH too high? 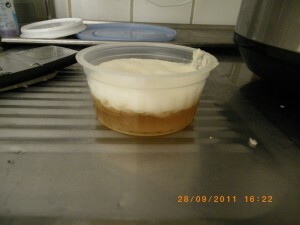 However, only when the soap is finished, otherwise you would neutralize your lye that you need for making soap. Maybe if you describe your problem in more detail? Hi fdsf, well, you have to add also other solvents first, not just alcohol, which you should not pour very quickly. Don’t forget it evaporates easily. I don’t know if you cooked properly, you should test if it passed the gel phase or not (I guess it didn’t). Will this be a re-meltable soap base I.E. melt and pour? I would love to offer a home made version of MP as well as other soaps to my customers. (So many people do not understand no lye, no soap!) This includes melt and pour bases. Can I use vegetable shortening instead of palm? I read that elveg shortening is very similar in soapinification qualities. Hi Poet, well, to some extent yes, just beware of the saponification value which can be slightly different and be sure you are using 100% fat. Hi Leonard, I never worked with a soap plodder, but from how it should work, I wouldn’t expect it to be able to produce transparent soap. Thanks for sharing. So nice of you!!!! Hello Evik, I have learned so much from the information you have shared on this website! I found it after I made a batch with a transparent recipe from another website- so wish I had seen yours first. Anyhow, my concern is that I had minimal scum during the dissolving stage but when I added the sugar water it was scum layer upon scum layer! I landed up with a scum ball the size of a tennis ball! The other much bigger concern is that, after two days, the soap, while quite transparent, is totally soft in the small molds with only a thin skin formed on top. (But the scum ball is hard as can be lol). Recipe called for 14oz ‘vegetable’ oil (My bottle said it was soy oil), 8oz coconut oil, 6 oz castor oil, and .75 oz sunflower or safflower oil. I did not have sun or saff.so used canola. I am very familiar with taking HP soap to gel stage in about 1.5 hr but this recipe said to cook for several hours until very hard. 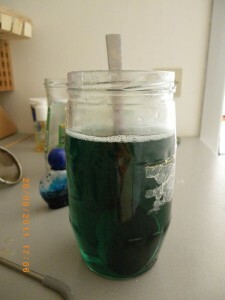 I did that, so when I added alcohol and glycerine it took almost 3 more hours to dissolve the soap. I added the sugar water and that’s when the scum started. And like I said before, the transparent soap has not hardened yet and frankly gives no indication that it will. Any help is greatly appreciated! Hi Rosemary, well, soybean oil, sunflower and safflower oil give very soft soaps per se. Now you dissolved them with alcohol and sugar… they might never harden at all. Unless all the alcohol and water evaporates…. Sorry for you, but the recipe is not good. It is better to use much more hard oils and butters because of the fact that you are dissolving your soap. Iv made c.failer transparent soap with ethnol 99.99% denatured. im from South Africa and you have to have a license for undenatured alcohol..Iv done two different recipes and both batches smell of alcoholIs. Is this normal? Iv pack them out and hope the smell will disappear! i want to know that is it possible? Hi Mehr, well, I know that sorbitol and sorbitan oleate are used for making melt and pour soap base. If alcohol is not used, it might be translucent, but I’ve never seen one that would be really transparent. Would you have the link to that recipe? Is there any result shown? you have mentioned about the pH there in your recipe! Can please tell me the range of the pH that I have to fix. will be waiting for your reply. Hi Swati, the pH should be definitely below 10, the best is around 8-9. My sister and I have made several CP batches of soap and we then tried our hand at transparent soap. It came out great! I was wondering if you know if you can use honey instead of sugar? and dilute the honey with some distilled water to make it more liquid. I know it is a different type of sugar but was wanting to give it a try, but thought I would post the question out there, so I don’t ruin a batch of soap. Ok so I am new to your site. For many years now I have been playing around with cold processing And making my own recipes from the start. I even have a lot of people who actually love my soaps… Go figure LOL even though they’re pretty basic. I just started getting back into soap making again and I’ve never done a hot process batch. While I’m pretty confident I won’t have a trouble with the process itself, I keep wondering why I’m confused about what you can and cannot do with this hot process transparent soap… For example I actually was looking to make transparent soap only because I was interested in making those gem or Rock soaps. But I seem to be very confused on how you can make these from scratch. Am I wrong, that you cannot use transparent soap? And that I’m supposed to be looking into how to make glycerin soap? Because it looks like you can’t remelt these down to create the layers U need. so when I go online to look up Rock soap or gem soap… Everything is about melt and pour. I have no desire to work with pre-bought prefabricated kits. LOL I’m trying to seriously figure out how I can make gem soaps from scratch….. you seem to be very patient with everyone and that’s just about what I need right now LOL. So I was wondering if you could point me in the direction of where I need to be looking to create my bases That I can cut down and remelt once all the different colors are prepared the way they talk about with the Melt and pour process. I’m almost starting to think that’s the only way you can make a gem soap? also one other thing I can’t seem to get through my head is when I’m reading everybody’s recipes for how they make their glycerin or transparent soap, it seems like there’s no structure on the percentage of oils they use for the base… I see people’s base be extremely up and down in the figures, and as I said before I’ve only worked with cold process where no matter what your base oils total 100%… Maybe I just saw The amount of product used and not the actual percentage breakdown in their recipes and so I’m dismissing that? So is it true that even for the base of a translucent soap, you still want your base oils to Total 100% And then make the Solvent start at 40% of the total of the base oil plus the lye, and go from there? I could really use some clarification here because I love being crafty and I want to make these gem soaps so bad or the ones that look like polished rocks and get really creative with it… because right now I’m sad that it looks like the only way I’m going to accomplish that is if I purchase melt and pour… ? Thanks! Thanks for all the great information. Would you mind telling the size of the crockpot used in this recipe? Hi Caroline, the crockpot has volume of 3,5 litres. What would be the TFM of this soap ? Good job, keep it forever…. God bless you. Here we want your help as we are new unknown for production of glycerine soap Base(transparent water colour glycerine soap noodles). Kindly give recipe for Base production easy & cheap costing as Commercial Production.